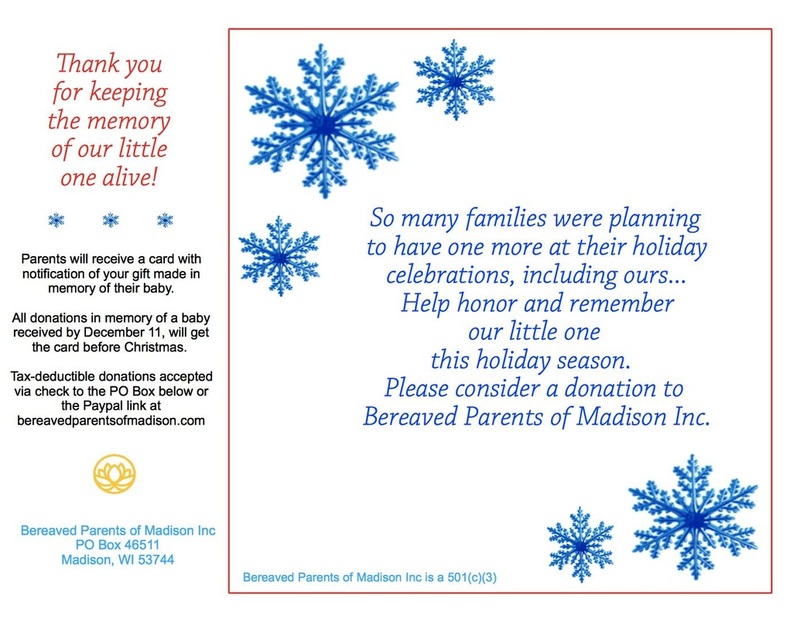 ​Here are a few ways you can support Bereaved Parents of Madison, Inc and our mission. We are always open to new ideas, so please let us know if there is a special way you would like to show your support! Ask for an employer match! Support or host a fundraiser! Stay connected on Facebook to help share events! We are always looking for volunteers to help on committees. Tasks can include everything from brainstorming to stuffing envelopes or hosting an event! We would also love to know what your talents are and find a special way for you to contribute! Sign up and we will get in contact with you to get started! YES! I want to volunteer! Please contact me! Here is a great link from WPR where you can check if your employer offers a match. You can also check your employee manual or human resources department. Some employers are very generous, please see if your is! Please stop over and LIKE our public Facebook page: PUBLIC: Bereaved Parents of Madison, Inc. There we post about upcoming events, fundraisers, and articles for family, friends and parents! Support or host a fundraiser with the proceeds to benefit Bereaved Parents of Madison, Inc. If you would like to discuss, please email bereavedparentsofmadison@gmail.com! We are currently collecting donations for our annual charity garage sale in the Midvale Heights neighborhood over Labor Day weekend. If you have gently used items you would like to donate, please contact: bereavedparentsofmadison@gmail.com to arrange pickup or delivery! This event was so much fun and a great success last year! We are also looking for volunteers to set up and work the sale.